Do you remember when you got your first tattoo? Was it planned or spontaneous? It was half planned! I knew when I turned 18 I'd start lobbying my mum properly to get one. I thought I'd try the legal angle, which doesn't tend to hold much water in Nigerian households, but I thought I'd give it a go! I expected it to be a lot of work, but my mum was like, “whatever”, so I ran with it and got tattooed the next day. I didn't know exactly what I wanted, I just knew I wanted 'traditional' tattoos. The artist shared a mutual friend with my sister so he hooked me up. I was very lucky it turned out good. I did no research into him as an artist, I just wanted the tattoo. My sister and I actually both got tattooed that day so it's turned into a beautiful memory; Lewisham, menthol cigarettes and the buzz of the tattoo gun. 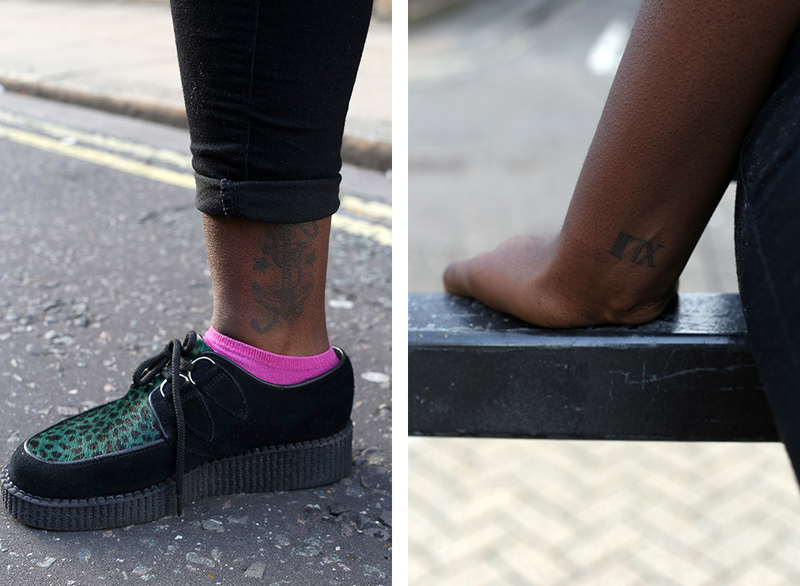 Why did you think your mum would be against the idea of a tattoo? Did her reaction surprise you and help you discover a new side to her? I think parents are always a lot more conservative than they actually are as a way of stopping their kids running totally wild. I wasn't totally surprised; my mum has her rock ‘n roll moments, she's just a bit squeamish. I think she knew it was inevitable. 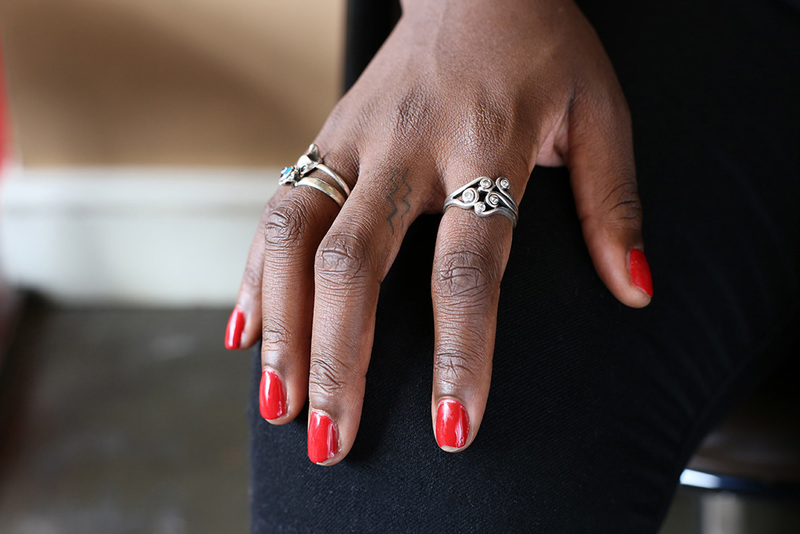 In contemporary Nigerian culture tattoos aren't the norm, but my mum told me about women back in the day who painted patterns on their bellies using a permeant ink found in cocoa seeds. My great grandma had it done. From what I've heard her she was quite a bold woman. My tattoos are really personal. They're not in easily viewable places. I see them as little markers of me and reminders of things I don't want to forget - like the dude in Memento! I want to indulge in the pleasure of taking my time getting tattooed for the rest of my life. 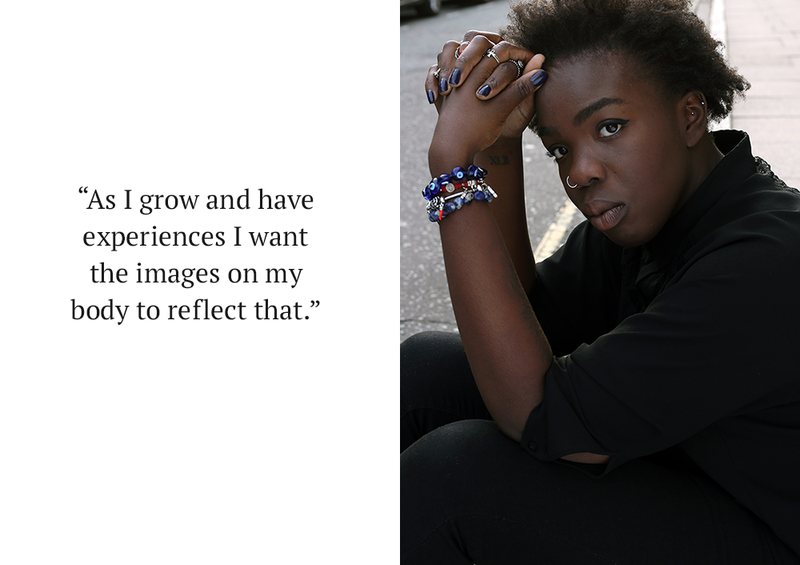 As I grow and have experiences I want the images on my body to reflect that. I'm approaching some things personally and the image to reflect that has been working away in the back of my mind for a while. 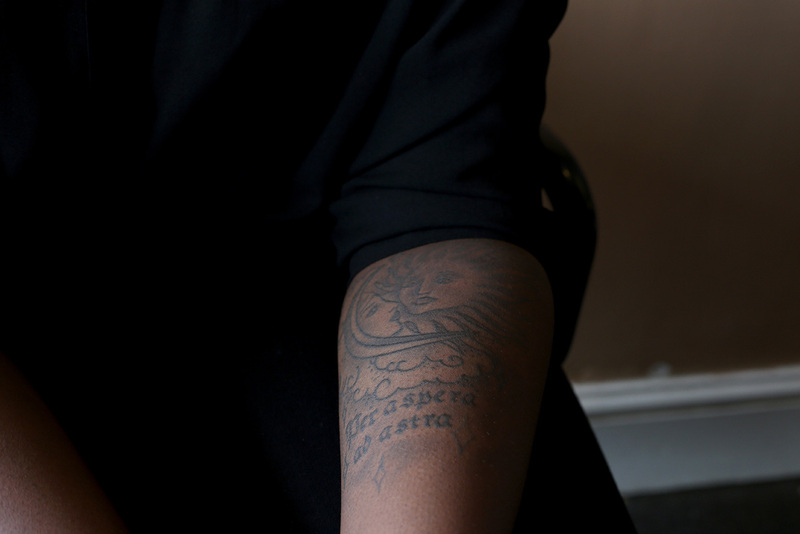 Can you remember what your first impression of tattoos was? “I want that!” I always knew I'd have piercings and tattoos. I'd feel weird without them. I know it's sometimes hard to explain something that feels so natural... can you try to describe though why it would feel weird to not have tattoos and piercings? What is it about them that forms an important part of who you are? I just feel like my tattoos and piercings are meant to be there for me to look right. Everyone has an ideal body image and mine includes these kinds of modifications. People always say the body is a temple as a way of suggesting you damage your body when you get tattooed or pierced. I've always found that perspective a little silly because temples are well looked after and quite often decorated. So I try to eat veggies when I can, drink plenty of water and get tattooed. 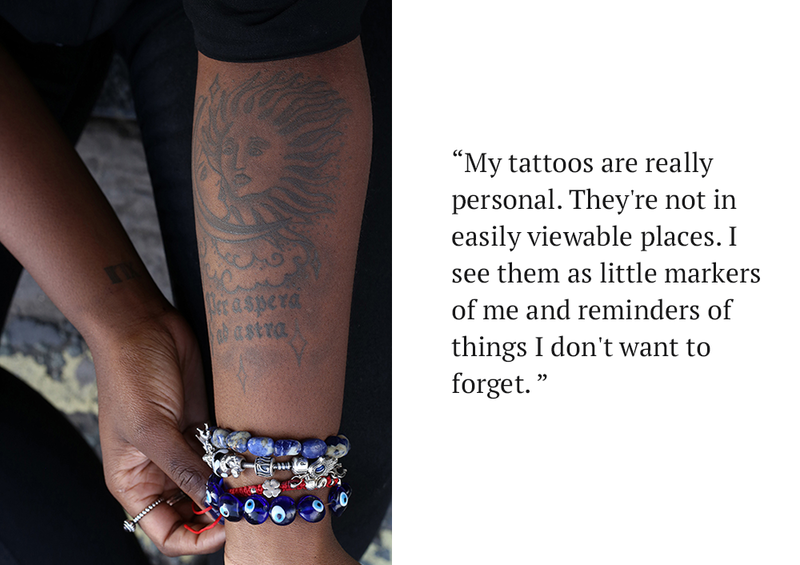 How would you describe the experience of getting tattooed to someone who has never experienced it? Exciting, nerve wracking and painful - like anything great in life! 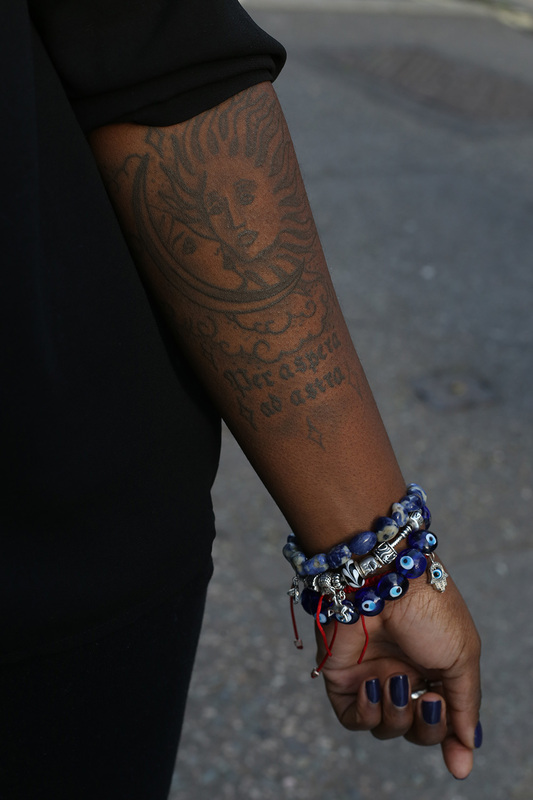 What's the story and meaning behind the tattoo on your inner arm? I'd just been through something and I couldn't decide whether it was the most terrible thing that had ever happened to me or the most incredible. It was both and it got me thinking about light and dark and how pointless it is to separate the two because they feed off each other. I wanted something that said that, beyond a simple yin/yang symbol. I like old astrology maps, tarot cards and the idea of being in outer space, so we pulled that in as well. The script [Latin: “per aspera ad astra”. Translation: “through hardship to the stars”] was the artist's idea, but I trusted her. After we spoke, she mocked it up in water colour and I was like “that's it”! 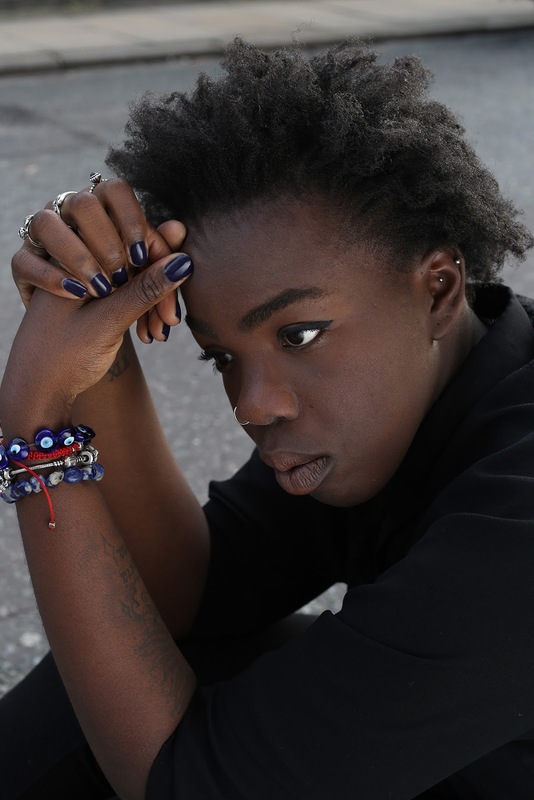 Do you think that the pain that comes with getting tattooed is something to 'put up with' or can it be a positive experience? The pain is part of the process, but it changes after an hour or so in the chair anyway. Your endorphins and the excitement seeing it come together take over. If you're lucky and the artist has great banter you just end up having a great conversation. So once you get over the searing pain it's all good!